That's right ladies and one gentleman (if there are even that many men reading this blog)... I'm back!! The trip was fantastic (to say the least) and I have many pictures to show you. Let's start out with a little preview, shall we? Above is Papa Monsanto and myself journeying to Berlin. It was a long day so you can tell how enthusiastic I was about having my picture taken. That's one happy camper folks. You really expected me to go all the way to Europa and not shop till I drop? 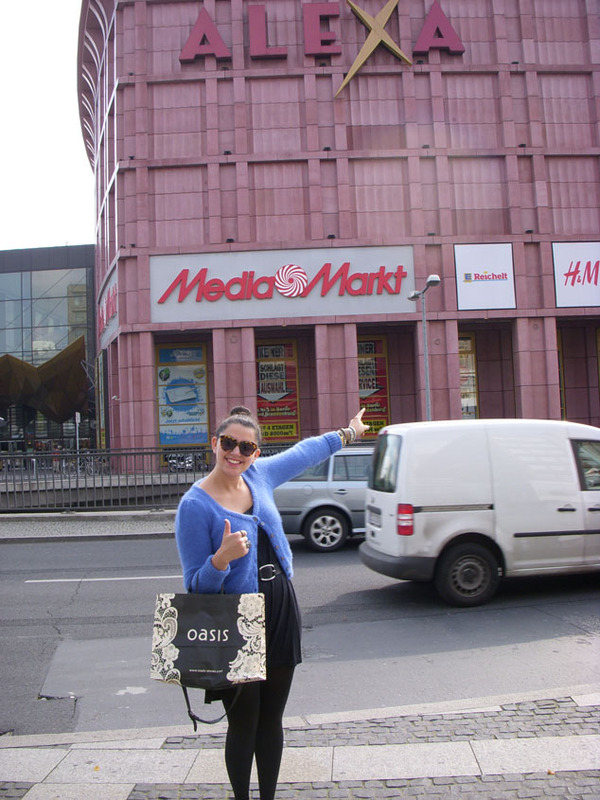 Here I am in Berlin giving a huge thumbs up to the mall across the street. I am the number one helper of all economies across the globe. Tweeting away in our posh hotel in Amsterdam. As you can tell I was mildly obsessed with wearing my blue fluffy sweater. Mostly because it annoyed my parents so much with it's constant shedding... muahaha (I'm cruel). And to answer your question, no, I did not wear this sweater everyday of the trip. I'm going to do a little Gaby tour guide of Berlin and Amsterdam. By Gaby tour guide I really mean where to shop till you drop, oh, and also eat till you feel beyond bloated (with goodness of course). I hope you're excited to see that I have not lost my sarcasm and great sense of wit. Glad to be back my friends, glad to be back. OMG guys you thought I forgot about the GIVEAWAY winner? Don't worry it will be announced tomorrow along with a brand new giveaway. I feel so generous as of late. I've been called saintly before, not gonna lie. Welcome back Gaby! Can't wait to see Berlin from your pictures, and all the goodies you got, have a great week ahead! Looks so much fun!!! I seriously can't wait to see the rest of your photos. Welcome back and glad you had a fantastic time! You look so cute tweeting away on your iPad. Welcome back!! Glad you had fun!